This piazza held Jefferson's workbench, where he is known to have made locks and chains. 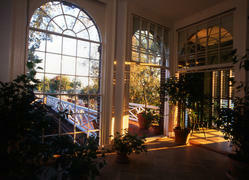 It also served as a greenhouse for growing plants and possibly as home to a pet mockingbird. It was part of Jefferson's suite of private rooms that included his book room, writing office (Cabinet), and bedroom, and was flanked by two small shuttered Venetian porches (recently recreated) that were pleasant places to sit and read. Dimensions 21' - 7" x 12' - 4"; ceiling 11' - 7 3/4"
Panoramic Image of the Southeast Piazza or "Greenhouse"